Bio Clean is a bio hazard cleaning company and can help you with disaster response in Olympia WA, Redmond, Renton, Seattle, Tacoma or Washington. When bad things happen there is always the cleanup and mess to deal with. When you face a trauma or bio-hazard situation, you need to know who to turn to for help. Some situations cane be overwhelming. There are many things to deal with – loss, emotions, heartache, confusion, what to do next. Bio Clean offers a wide range of bio hazard remediation services including suicide cleanup, homicide cleanup, unattended death cleanup, accident scene cleaning, medical waste disposal, hoarding cleanup, meth lab cleanup and more. When faced with a disturbing and traumatic scene, you already have enough to deal with and many things you are not even sure how to deal with. The last things you need to be burdened is cleaning up the physical mess. Fortunately there are companies that provide bio hazard and scene cleaning. When you need disaster response, Bio Clean will be there for you. Bio Clean will work quickly and effectively to clean any bio-hazard situation and restore your residence, building, facility or property to pre-disaster state. You should not attempt bio-hazard cleaning yourself. A bio hazard scene is by its nature a risky environment. It will contain contaminants and potentially infectious substances. That is why professional cleaning crews where protective gear and use specialized equipment when performing bio-hazard remediation. There are also rules and regulations that govern how bio remediation should be carried out. 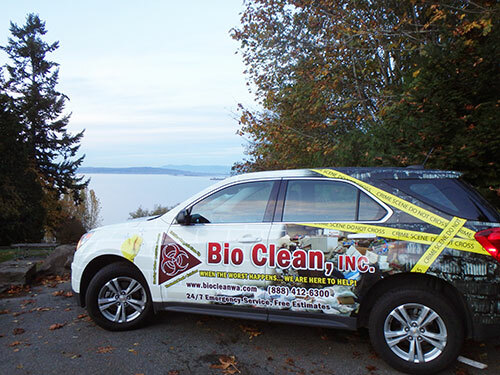 When you need bio hazard remediation and disaster response in Olympia WA, Redmond, Renton, Seattle, Tacoma or Washington, you need look no further tan Bio Clean for prompt and efficient assistance. They will restore your property to pre-incident condition quickly and effectively.